For too long, Joan Silber has labored in the shadows, her work overlooked, underappreciated and read by too few. I’m here to correct that. Or at least give it my best shot. 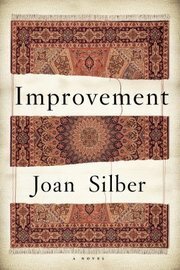 I just completed her latest novel, Improvement, and it is a stunning work, full of subtlety and insight, conveying an understanding of how ordinary people struggle to make something of their lives. Politicians who want to connect with “real” Americans would have a better chance of doing so if they studied Silber’s work, beginning with Improvement. Reviews often describe this novel as one of linked short stories, but I don’t think that’s fair. While most of the chapters can stand on their own (and some were published that way), they are more linear and more intertwined than the linked-story novels you may be used to (think Elizabeth Strout’s Anything Is Possible or Olive Kitteridge). In Silber’s novel, you have to consider the stories together to appreciate the rich tapestry that Silber has created. The technique is particularly effective in her hands. Each chapter allows her to focus on–and fully explore–a single character, but too much is lost if you don’t consider how those individual lives affect the people around them. The key character is Reyna, a single mother of a four-year-old, whom we first see as she treks each week from Brooklyn to Rikers Island to see Boyd, a boyfriend who is doing a short jail stint for a minor drug offense. When he gets out, their relationship reignites in every way, but it can’t last, largely because Boyd hangs with the wrong crowd and can’t steer clear of the law. When Reyna is enlisted to help, everything goes wrong, including their relationship. Then there is Kiki, Reyna’s scolding, sixty-something godmother. Kiki has an interesting backstory that fills a couple of the chapters. As a young woman in the 1970s, she left her family in New York for Turkey and ends up marrying a carpet merchant. They’re happy for a few years, but before long, Kiki gets bored and eventually returns to New York, alone and mostly happy and close by for Reyna. The novel is alive with other vibrant characters: Darisse, another struggling single mom, works as a home health care aide, kind and tender with her patients despite her troubled personal life. She can’t understand why her greatest love, Claude, stood her up and won’t return her texts and calls. Hers is the kind of world where no one would know to tell her that Claude is dead. Lynnette, Claude’s sister and closest companion, struggles with her sibling grief, both because of genuine love and because her brother’s death seems to mean the end of her dream to go into business with Claude, who has promised to use his share of the illegal loot to set her up with her own nail salon. One of my favorite chapters is about Teddy, a 57-year-old truck driver whose guilt over Claude’s death contributes to the end of the affair he’s been having with his ex-wife. Teddy has trouble coming to terms with his role in Claude’s death as well as his role in the death of his first marriage (and maybe the second). Improvement proves to be the perfect title for this book. It’s the elusive goal that all the characters are striving for, though it takes many forms—domestic, financial, romantic, and professional. Silber is particularly good at exploring her characters’ personal relationships—with all their needs, joys, frustrations, and fulfillments. She often challenges the reader to separate fact from what her characters believe is fact. She drives the challenge home when one character’s life is turned around by an anonymous gift that she wrongly believes comes from an ex-lover. Knowing he’s still keeping an eye out for her welfare powers her personal improvement, even as the reader knows she’s mistaken. At 72, Silber has written at least three great books, according to Washington Post critic Charles Finch, whose review of Improvement first brought her to my attention. I found Fools, a book of more loosely linked short stories, somewhat uneven, with the stories ranging from superb to just good. Like Fools, the third book mentioned by Finch, Ideas of Heaven, was a finalist for the National Book Award. It’s next up on my list.